I actually looked into getting this working on Windows several months back, but I hadn’t used it or pursued it any further, so rather than trying to retrace my steps, I started again from scratch (I also wanted to get it working on my Mac rather than on Windows). This issue is apparently directly related to cross compiling on a different hardware architecture, and the solution is to add the –specs=nosys.specs option to the loader config. I added this in Eclipse in project properties, C/C++ Build/Settings/Cross GCC Linker and added into the Expert Settings Command Line Pattern and this fixed this issue. 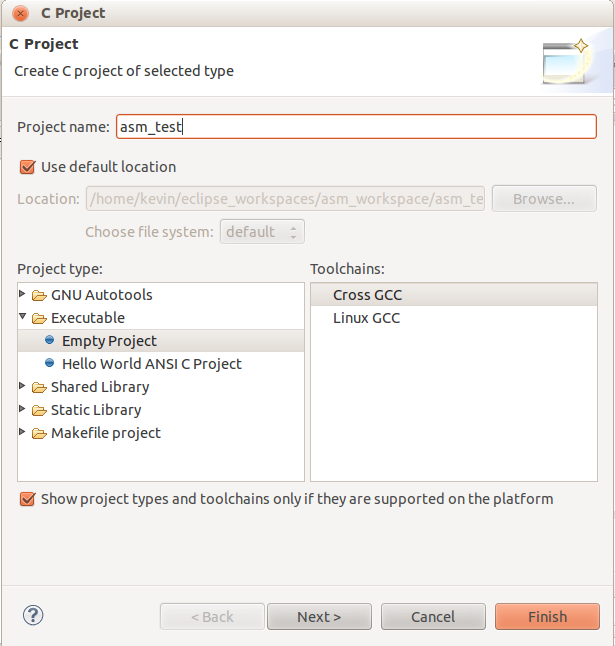 In Eclipse C++, in the Run Configuration settings you can select ‘New Connection’ and configure a ssh connection to your Pi. You need to also set a full path on the Pi for where the file is going to be dropped. At this point I get this error: “Error during upload : File system input or output error”. Executing the file on the Pi itself I get a Seg Fault. Searching around, the general suggestion seems to run ‘file’ against the executable to check that it was compiled and linked against the right architecture. Ok, so clearly I’m close but not there yet. From other posts like this one (some of the key screenshots in this one seem missing) and this one, it seems it far easier and more direct to use the ready to go compiler crosschain from the RaspberryPi project available from github here (and not just a more generic toolchain for ARM processors but not specifically for the Pi and/or Raspbian). 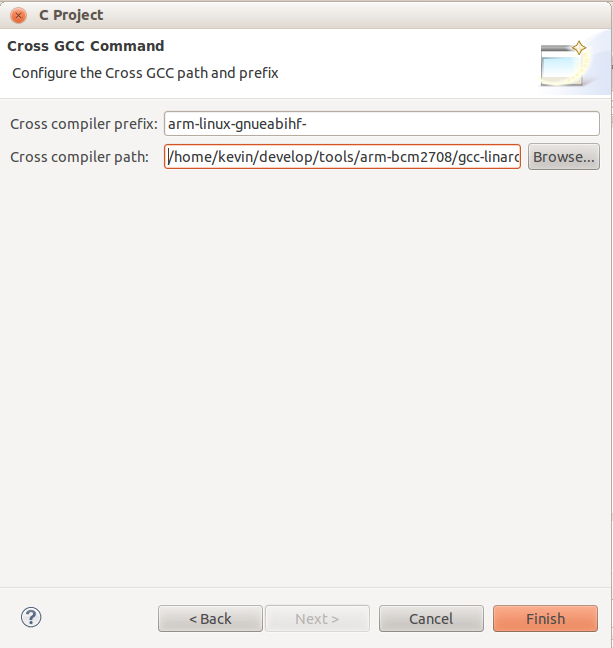 This is compiled for Linux, so following the tips in the prior two articles, this was my next attempt. Clone the Tools.git project from the above github project url. To build the project, select Build and Build All. You should see a Binaries entry in your Project Explorer tree view appear. To deploy the code over to the Pi we can set up the Run Configuration selecting the Remote Application option again, use ssh and point it to your Pi. Now I’m still getting the same generic input/output error that I was before, so I ssh’d over to the Pi to take a look at the new file that had appeared over there, and noticed that it wasn’t executable, so on the Remote Execution step you still need to do a chmod +x on it. Adding the chmod seems to get us an executable on the Pi side, but still get the i/o error.